1.Who is an existing taxpayer? 2.What does the word ‘enrolment’ under GST system portal mean? 3.Do I need to enroll for GST? 4.Why do I need to enroll myself as a user on the GST System Portal? 5.When do I need to enroll with the GST Systems Portal? 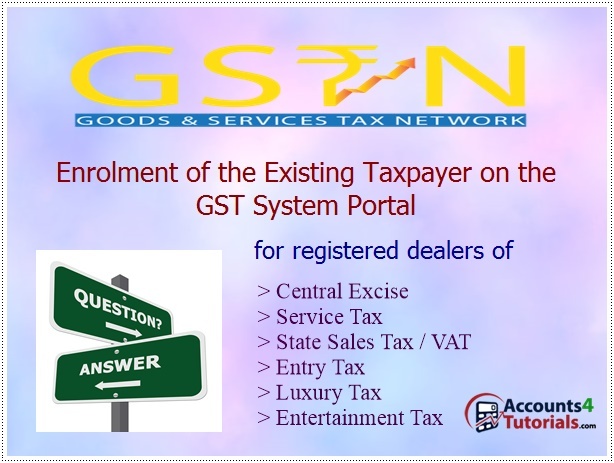 6.Is there any concept of deemed enrolment on GST System Portal? No.There is no deemed enrolment on GST system portal. All the taxpayers registered under any of the Acts as specified in Q1, are expected to visit the GST System Portal and enroll themselves. 7.Is there any fee/charge levied for the enrolment on GST System Portal? 8.Is the enrolment process different for taxpayers registered under Centre /State/UT tax Acts as specified in Q1? 9.Are taxpayers required to enroll separately with Central and State authorities under GST? 10. What is the format of Provisional ID? 11.What information should be readily available with me before I begin to enroll with GST? 12.Which username do I need to provide during first time login. Can I use the same username and password which I used to login as State registrant? 13.What user ID can I choose after first login? 14.I have not received my username and password to apply for enrolment with GST. What do I do now? 15.Can I give email address and mobile number of my Tax Professional during enrolment with GST? 17.How long the OTP is valid? 18.I have not received the OTP on my mobile? What do I do now? 21.I have received OTP in my mobile. I have entered the same OTP in the OTP verification page for Email OTP and Mobile OTP. Are these OTPs different? 23.What does the red asterisk (*) appearing besides the fields in the enrolment application indicate? 26.How to find out my Ward / Circle / Sector No? 27.How to find out my Center Jurisdiction? (refer URL - http://www.cbec.gov.in/resources//htdocs-cbec/deptt_offcr/cadre- restruct/cadre-restructg-notifications.pdf). 28.I am not able to upload any document. Why? DIN stands for Director Identification Number given to Directors of a Company by Ministry of Corporate Affairs. To know your DIN, refer your DIN allotment letter issued by Ministry of Corporate Affairs or visit the MCA portal - www.mca.gov.in. 31.I don’t have my Aadhaar Number. Is it mandatory to provide the Aadhaar Number? Principal Place of Business is the primary location within the State where a taxpayer's business is performed. The principal place of business is generally where the business's books of accounts and records are kept and is often where the head of the firm or at least top management is located. 36.I have more than one bank account. Can I add all of them while enrolling with GST System Portal? You cannot submit the enrolment application if your DSC is not registered with GST System Portal. Therefore, you need to register your DSC on GST System Portal by clicking “register your DSC”. If you have valid DSC, you can visit GST System Portal and click on “Register your DSC” link. The PAN of the DSC holder should match with the PAN database of the CBDT. After validation the user should select the certificate link which is to be registered. Only class -2 or Class 3 DSC can be registered in the GST System Portal. Taxpayer need to click on “E sign” button. 1.After validating the Aadhaar Number, the GST system Portal will send a request to UIDAI system to send a One Time Password (OTP). 2.UIDAI system will send OTP to email address and mobile number registered against Aadhaar number. 41.Is there any charge applicable on submission of the application for enrolment? 43. What is the format of ARN? 45.I have not yet received the Application Reference Number (ARN). What should I do now? 46.While entering the details, internet connection was lost. How can I retrieve the saved enrolment form? 48.My DSC has expired / revoked? What do I do now? Hello, Thanks to share detailed information of how to confirm GST registration and Know Your Jurisdiction to fulfill legal formalities.